By road If you are arriving by car please try and share a car with other guests or if there is a party of you, think about using a minibus to reduce CO2 and congestion. While at Cissbury please drive slowly and carefully at all times as there are horses, dogs and children as well as other pedestrians around. Travelling south on the A24 towards Worthing Cross straight over the roundabout at the top of Findon, following signs to Worthing. Ignore all signs to Findon and turn left when you see the sign for Nepcote, Leading to Nepcote Lane. Go up the lane for about 100m until you reach the sharp left hand corner, at which point turn right into Cissbury’s driveway. If you are coming to the house or walled garden, take the left drive, sign-posted for the house and turn into the car park on the right. Please park on the grass between the hard tracks. 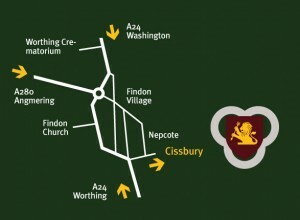 If you are going to Cissbury Barns take the right driveway and follow the signs through the stable yard and up the track. Travelling north on the A24 from Worthing After leaving Findon Valley and the end of the 40mph restriction, take the first turning on the right, sign-posted Nepcote, Leading to Nepcote Lane. Go up the lane for about 100m until you reach the sharp left hand corner, at which point turn right into Cissbury’s driveway. If you are coming to the house or walled garden, take the left drive, sign-posted for the house and turn into the car park on the right. Please park on the grass between the hard tracks. If you are going to Cissbury Barns take the right driveway and follow the signs through the stable yard and up the track. Bus services There are frequent Metrobus services that use the A24 bus stops that connect Crawley and Horsham with Worthing (Number 23 Service), also the Midhurst to Worthing (Number 1 Service). There are approximately two buses per hour that connect the nearest bus stops, which are located on the A24 approximately 20 metres south of the sign to Nepcote. The last service to Worthing on a weekday and Saturday is at 19.40 and on Sundays at 18.35. The last service from Worthing to Findon is at 18.55 on weekdays, 18.47 on Saturdays and 18.04 on Sundays. For the next available bus text the bus stop code wsxdajpa to 84268.